We found a banging deal out of JFK to Madrid for $500 with Iberia Airlines. Since we knew we’d be spending the bulk of our trip in Spain, we chose to grab this flight deal and start there. My friend and I lucked out with no one sitting in the center seat in Economy, we found our flight to be super comfy. The entertainment provided was awesome – I watched new releases and finally mustered up the confidence to watch “Me, before you”. I almost balled my eyes out, seriously. Not to mention the new in-game system they have (I enjoyed angry birds for the better half of my flight, haha!). The food was good and we especially enjoyed the free Wine that was passed out! From Madrid we flew into Marrakech (also with Iberia Airlines). This was a super quick flight (roughly two hours). Warning: you will be time confused. Although Madrid looks like it’s on the same axis as Morocco, it is not! Morocco is exactly one hour behind Europe making it only 5 hours ahead of Eastern Time (8 hours ahead of Pacific time). Note about your outbound flight in Morocco: Due to recent constructions, you must arrive to the airport 3 hours ahead of departure. We thought people were kidding but seriously, they are so disorganized and understaffed, lines took forever. We got to our gate right when the flight was boarding and we had gotten to the airport 2.5 hours ahead of time. The Red City of North Africa is filled with wandering allies, curious cats, hypnotizing show acts and aggressive salesman. 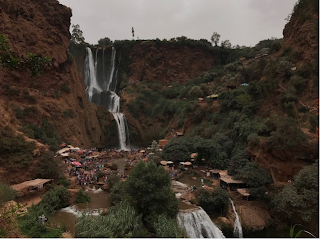 Filled with tourist, this is a great city to venture if you’re skeptical about smaller towns in Morocco. Below is my itinerary for my four day journey. FULL DISCLAIMER- expect a ton of hospitality and mint green tea! We chose to exchange our Dirhams in NYC however, at a 3rd party shop, later we realized that exchanging in the airport was actually about the same price (perhaps slightly cheaper). We exchanged about $400 each which equates to about 3,200 Dirhams. We later found out that we should have exchanged more as no one really took credit other than our Hotel. 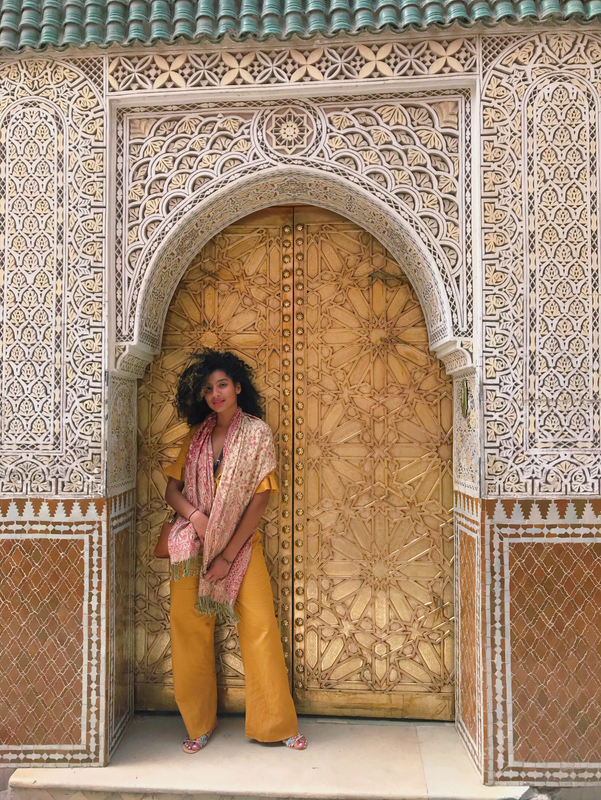 Fair warning – everything in Morocco could be compared to NYC prices when it comes to food and shopping. Note from the Editor: if you plan to exchange money ahead of time, check with your bank for exchange rates and compare it to the ongoing rate by using an app such as XE Currency to keep track of rates. Exchanging it at 3rd party locations usually pays less, just like doing it at airports does. Make sure you do it at least 1 week before your trip. We booked our Airport pickup and drop off via Get Your Guide – it was $15 each way (super cheap!). 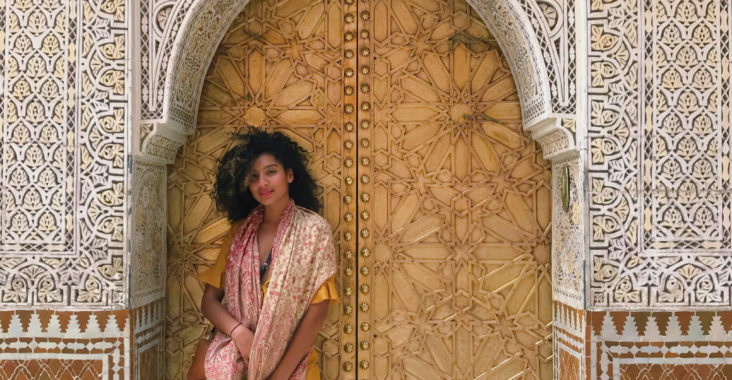 Traveling within Morocco is super tricky. For the most part, your only option is to travel by foot. The streets within the city center are narrow and many streets do not allow motorcycles to pass let alone cars. 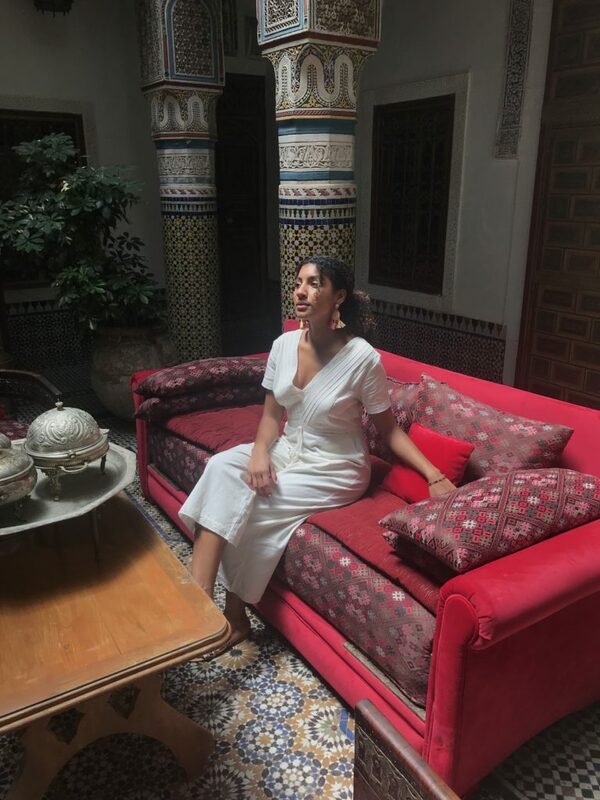 If there’s one piece of advice I can give you, it is to stay at a Riad! We stayed at the Palais Sebban which was absolutely dreamy! 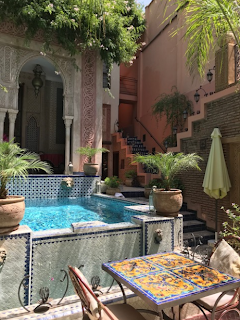 We later found out (through some new friends we made) that Riad actually means an Oasis behind walls. I can’t explain how accurate this is. 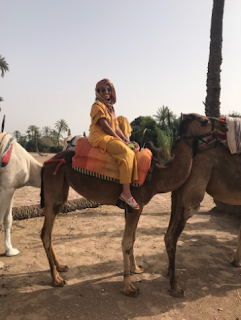 When we first walked towards our Riad I must admit we were a bit skeptical. We were greeted by large red walls and upon entering you felt like you were walking into someone’s home via a back alley. However, once we passed all of that, it felt like we entered a magic box where the outside looked completely different then the inside. Not to mention the fact that we were greeted with our first batch of mint tea and biscuits. It was INCREDIBLE even my friend, who’s not a tea drinker, found it super tasteful! 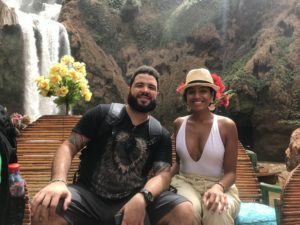 Saturday: We arrived fairly early but exhausted from our travel (total 12 hours we didn’t leave the Spain airport, we hopped on another flight to Morocco) we chose to spend it out at our Riad’s pool, eat food and make new friends! That night we had a dinner at the well known Comptoir Darna with our newly found friends. Amazing food, delicious drinks, belly dancers, candles, costumes, clowns, whips, hookah…It is a great experience. I certainly recommend! 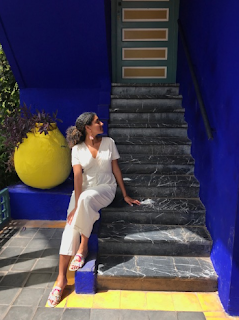 Sunday: Thanks to our night out, we woke up late and adventured off to visit the Majorelle Garden around midday. While many recommend visiting earlier than 1pm, I did not once feel like it was too crowded. I got the photos I wanted, indulged in the beautiful scenery and got some relief from the beaming heat under some shade. That afternoon we explored the Medina for the first time. 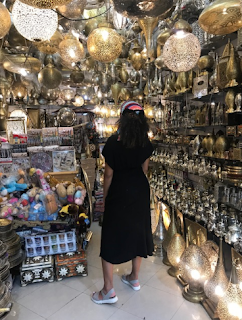 It was amazing seeing all the beautiful fabrics available for purchase, sniffing the different spices displayed all while sipping various cups of natural orange juice. Be aware: you will be confronted by many Salesmen who are quite aggressive and my second best advice to you would be to look first, get some prices and return to shop at a later time. We realized late in the game that we were over paying for MANY items. For example: a pashmina scarf started at the price of 300 Dirhams (approximately 30 dollars) and with some negotiating dropped down to 200 Dirhams (approximately 20 dollars). Our final day shopping we found a humble shopkeeper, Omar, who sold the very same scarfs for only 80 Dirhams. Best believe we purchased about 6 scarfs in total just because he was honest with his prices and so incredibly kind to us. Later that evening we booked a Hammam experience with Rosa Bonheur thanks to a friend’s recommendation. We chose the Royal treatment which included a traditional Hammam experience: full body massage, foot massage and a 3 course meal. All I have to say is if you go to Morocco and don’t take the time to experience this weekly tradition, did you really even travel there?! 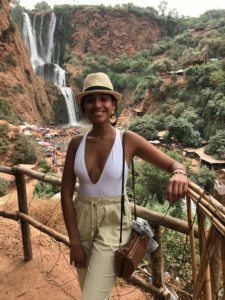 Monday: Bright and early we ventured to the Ouarzazate Waterfalls! We booked this via Get Your Guide. The excursion included transportation to and from and personal guide for our group to the Waterfalls and olive farms. In short, this is a beautiful waterfall with an amazing history. 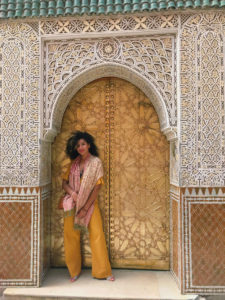 However, because you’ve ventured outside of Marrakech, please note, that the dress code should be slightly more conservative. Tuesday: Our last day in paradise and we chose to do Camelback riding. Again, booked via Get Your Guide and it was a wonderful experience. We took a 10 minute tea break with locals and they welcomed us with open arms. Please know, these are humble people welcoming tourists into their homes as guests. My friend and I generously tipped them for their time and kindness. I suggest you do the same. In between our 7pm flight and Camelback riding we chose to explore the Medina one final time. This time, we were prepared to barder and spend our remaining Dirhams. In the mix of things, a local shop owner recommended a place to eat and even had a guide pick us up. The experience was pretty cool until we got lost trying to get back to our hotel. PLEASE DO NOT FOLLOW PEOPLE WHO SAY THEY WANT TO HELP. They are either trying to get you lost on purpose or want to help for a price. This was probably the most upsetting part of our trip but the reality is, we needed that guide otherwise, we would have totally been lost. PS. We also have a second shorter Morocco guide here. Overall, Morocoo was a dream. If you are planning to visit, we hope this guide has helped you with some ideas on things to do and things to look out for. If you visit, please tag us on your Instagram pictures. Upon request we have included this on our guides. Thank you! To send an E-Giftcard you can click here. Our e-mail here.